1. When God the Almighty One was making mankind through His own Word, He saw that they, owing to the limitation of their nature, could not of themselves have any knowledge of their Creator, the Incorporeal and Uncreated One. He took pity on them, and did not leave them without the knowledge of Himself, otherwise their very existence would prove without purpose. For what use is existence to a creature if it cannot know its Maker? How could men be reasonable beings if they had no knowledge of the Word and Reason of the Father, through Whom they had received their very being? They would be no better than animals, if they had no knowledge except of material things. And why would God have made them at all, if He had not intended them to know Him? 2. But, in fact, God who is good, has given them a share in His own Image, that is, in our Lord Jesus Christ, and has even made them in the same Image and Likeness. Why? Simply in order that through this gift of being like God in themselves they might be able to perceive the Original Image, that is the Word Himself, and through Him to apprehend the Father. This knowledge of their Creator is the only really happy and blessed life for mankind. 4. Moreover, and much worse, they transferred the honor which is due to God to material objects such as wood and stone, and also to man; and they went even further than that, as we said in our previous book. Indeed, so wicked were they that they worshipped evil spirits as gods in satisfaction of their lusts. They sacrificed animals and offered the blood of men, as the if demanded by these deities, thereby bringing themselves more and more under their insane control. Magic arts also were taught among them, oracles in different places led men astray, and the cause of everything in human life was traced to the stars as though nothing existed but that which could be seen. 5. In a word, impiety and lawlessness were everywhere, and neither God nor His Word was known. Yet He had not hidden Himself from the sight of men nor given the knowledge of Himself in only one way; but rather He had unfolded it in many forms and by many ways. 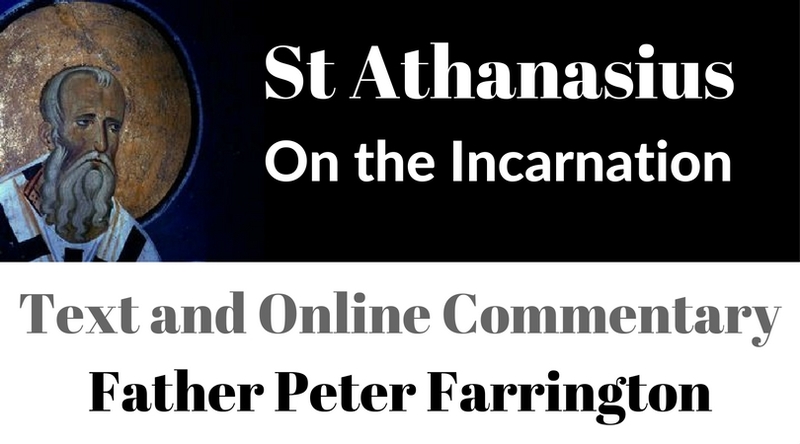 What do we find in this chapter by St Athanasius? It is that created beings, by their very nature are simply animals unless they receive, as a gift of God, the knowledge of their Creator. To live without a knowledge of God is to live a life without purpose. God could not bear that to be the case. He did not make mankind to live simply an animal existence. This is not a punishment, but it is the natural condition of mankind, of all created beings, if they are not given the knowledge of God, an experience of God, which makes us reasonable beings. It was always the intention of God to make mankind to know him, not just to have an appreciation of facts about God, but to have a direct knowledge of God himself. Mankind was not created simply with the possibility of coming to a knowledge of God, but we were created bearing the image and likeness of God ourselves. We are hard-wired to find satisfaction only in God. We have something in common with animals, but we also have something in common with God, and just as we need food and water for our animal existence, so we cannot hope to possibly prosper as those made in the image of God unless we come to know God in whose image we are made. It is not enough to think we know things about God, we have to come to know him personally and be known by him. This is what it means to be truly human and the only possible means of living a really happy life. If only mankind valued the gift of being like God, and being able to enter into a relationship with him. Through our own choices, sinful choices, we have so corrupted our soul that we can no longer see that God is there, or understand what he is like. We have turned away from God and made gods of our own. In the place of what is really true we have invented a fantasy world. We have made the things we see and own and desire our gods, instead of the one who made all things. Not simply other gods worshipped in temples and shrines, but wealth, careers, prestige, success of various kinds, popularity and possessions. We worship what we value most. For many of us, what we really value is not our relationship with God, but the things we own, or hope to own. The people we like to be associated with, and the people we hope to be associated with. When we would rather be thought well of by other people, and will do whatever it takes to impress them, then we no longer give God the honour he deserves. When we are more interested in satisfying our own desires for immediate gratification, rather than God’s desire for our union with him, then we are not honouring God and his purposes for us. Such a way of life leads us to imagine that God doesn’t really have anything to do with our lives, and is distant and practically irrelevant, while what matters is only what we can see and touch and possess. When the knowledge of God is lost, or is forgotten, or ignored, then mankind falls into wickedness of every kind. We find ourselves falling into a state where things are out of control. But even though we have ceased to seek God, he has not ceased to reveal himself and offer the knowledge of himself, and a relationship with him, in many different ways.